The hiking trails at the Mildred Cushing Woods Conservation Area are almost unnoticeable. 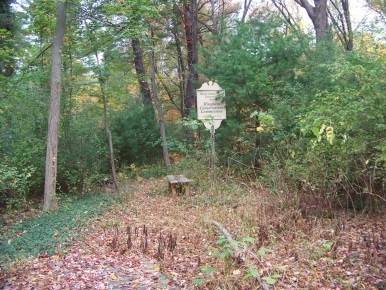 The trail head sitting just east of Cushing Pond on Cushing St., the 19 acre property looks unused and is set back from the street. a small pond from the street. This area is made better use of by parking at the pond launch site. Here there is room for one or two vehicles pond side and a few more across the street. It is better to walk down to the trail entrance from this point if that is where you wish to start your journey of this property. At first glance this conservation area seemed small, so I thought!! This one is a bit misleading. 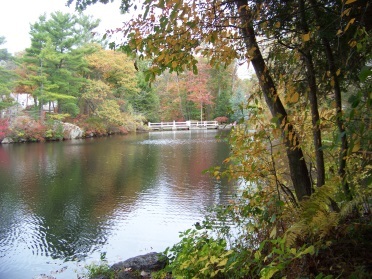 The trail head sits down street but there is a narrow trail entrance at the pond itself. Barely seen or noticeable. Upon reading conservation material I also learned there is another 4 acres on the western side as well. Some wooden posts lead the way in at that side and surprisingly there is a somewhat lengthy set of trails on this side as well! At the pond itself there is a boat ramp which is also another very good way to experience the Cushing Woods. 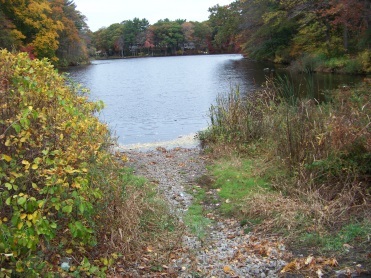 There are several pond launch/take out sites in the woods. 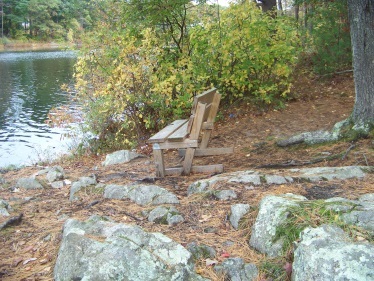 One prominent one can be easily found as it has a bench placed there as well, also known as Cushing Point. 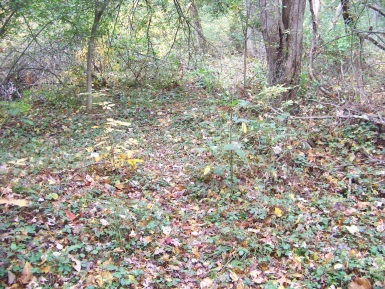 At the trail head site, the hiking trail is an access trail that leads between two private properties. From this end this trail needs some work. It is narrow, wet and at times fades away or is blocked by fallen trees or heavy briar. This lets out to a wider hiking trail that if taken to the right leads into a field that in warm months the owner has made paths through that field leading one to wonder "if this part of the conservation area"? Following to the left at this intersection will lead down to the main trail along the pond shoreline. On the way it passes through an area that shows evidence that it had been private property at one time. There is much ground cover flowering vegetation. The trail also traverses a stream by way of a culvert most likely made some years ago. The trail then passes through a bit of a young pine stand and then climbs briefly up to a rocky area punctuated by a large boulder. The trail narrows and becomes barely evident leading downhill at an angle and then joins the main trail. 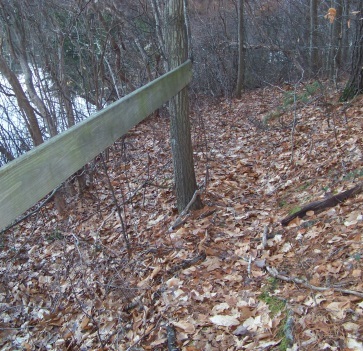 If you have used this access trail into the property, my advise is to go right at this point. Cushing Point is just a few feet down the trail and a main highlight of the conservation area. Too bad it is marred by trash left from those who enjoyed the area a bit too much. 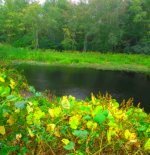 Here the full length and breadth of the pond can be seen. Much larger and very interesting than a first glance at it. The trail continues on close along the shoreline of the pond. Further down the hiking trail it will gently lead uphill and soon the sounds of rushing water will be heard. At the far end of the pond is Cushing Dam. This end of the trail will soon end at the pond side facing the dam. There unfortunately is no way out to the dam from the woods. There are a few trails leading along the edge of the water but end at private property lines. Leading straight away from the ending at the pond side is another narrow path that leads up hill through an area that looked to once be a road way. 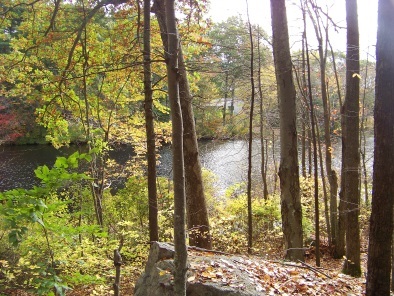 There are several granite blocks at the trail end by the side of the pond. 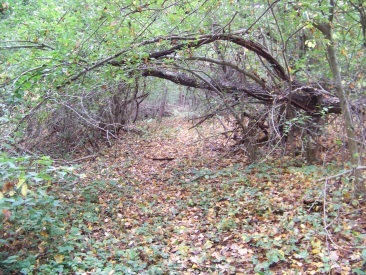 Following the path that leads uphill through the "road way" the area shows evidence that indeed it was a road at one time. 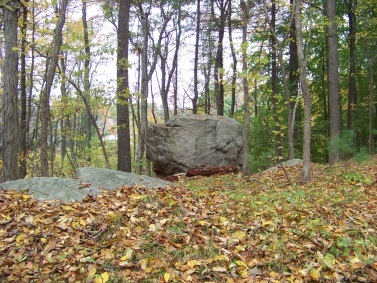 The trail ends at a granite post at the backyard of a private residence. All this granite made me believe there was some history to this scenic little pond. 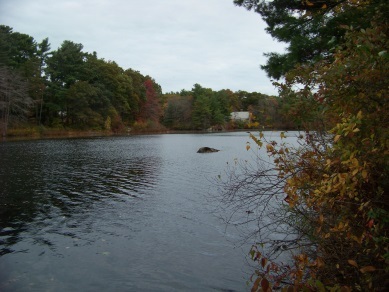 A little bit of research I found that the town of Hingham calls this pond Historic Cushing Pond. Most likely this roadway was the main entrance to the ice house that once existed here as part of a major business in town. The Charles Leavitt Ice House. 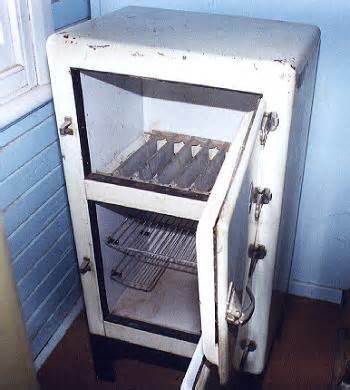 In the days before electricity and refrigeration and after the days of using salt as a preservative, ice, the storing and use and delivery of it was big business. Ice delivery or a trip to the ice house was a regular necessary chore in those days much like getting gas for your vehicle nowadays. In the pictures the top compartment was where the ice was housed. Putting the ice in this location creates air flow. The ice cooled the air inside the box. As the cool air sinks to the floor and hot air rises it cools the food held below on racks and creating the air flow. 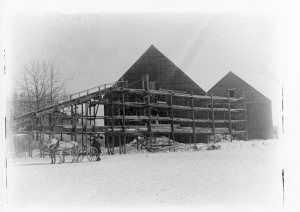 Back at the pond, large blocks of ice were cut, sledded to the ice house and stacked filling the floor first and then stacking to the ceiling of the house. Once the house was filled it was well insulated with hay. The blocks would remain frozen throughout the summer and into the fall. This operation continued til 1902 when Charles Leavitt sold the operation to George C. Hayward who continued the business another 20 years. 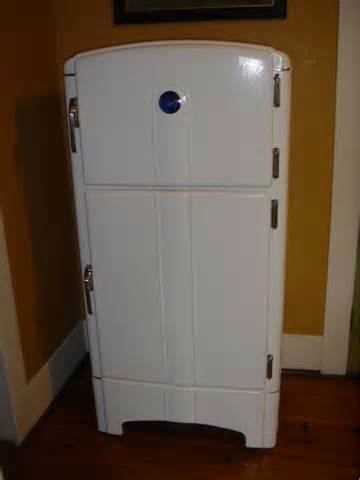 The electric refrigerator became the modern way to preserve food and the days of ice delivery became obsolete. 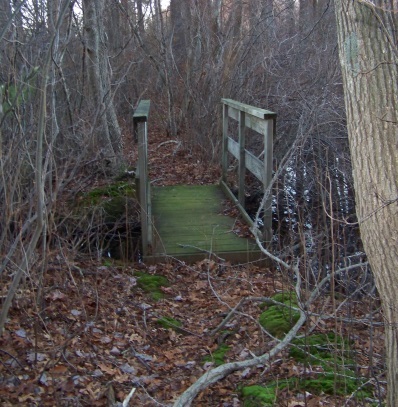 Now that you have visited the historic side, turn around and follow the hiking trail back to Cushing Point and past the entry point that brought you into the woods. The trail will now lead a bit away from the shoreline and more into the forest. It passes over the same stream the access trail lead you over, but now closer to the pond. 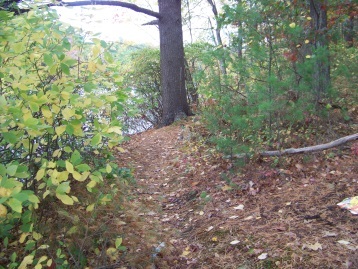 This portion of the hiking trail will turn right and lead below a hill and come once again close to the shore of the pond. It will pass an area that would be a good canoe/ kayak pull in. It will eventually lead behind a private residence and out onto Cushing St at the boat launch area. From here you can either end your hike or continue on to the western side of the pond. At this point you will have hiked just about one mile. Across over to the western side of the pond, you will find three posts with holes that appear that they once held rope within. These will lead you to the hiking trail on that side. 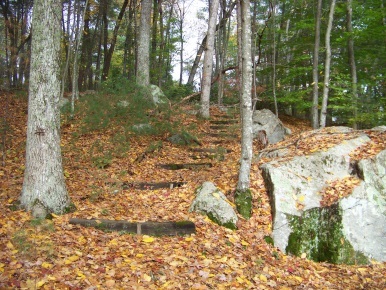 At a large rock there will be rail road tie stairs drawing your attention and leading you up hill. At the top of these is a bench. 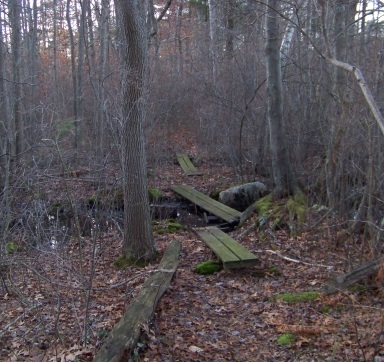 The trail there continues on but once exploring it you will find yourself at private property. Back at the bottom where the rock ushers this trail uphill, with a second look you will find a narrow trail that continues along the shore to the right. This will follow in a curved pattern and arrive at a small bridge. Before doing so you will have to navigate through an area with several fallen trees and the trail seems to scatter in all different directions. Climb a bit uphill and then down again. The trail along the water will soon become defined again. More views of a "leg" portion of the pond appear. Uphill you will find a private property as about the time you feel like you are walking in a back yard you will come upon a bridge over to what appears to be an island. 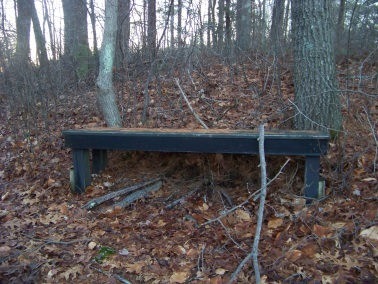 There will be another bench just shortly up the trail. The trail continues on to the right. 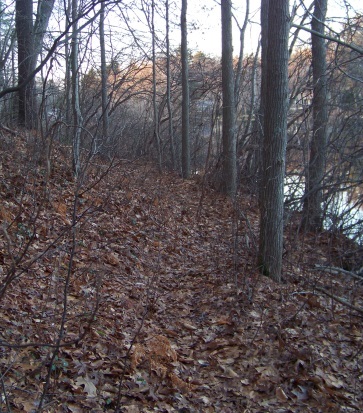 The hiking trail will come out to a small clearing but continues on after it. It will take a slight right and follow downhill a bit to some planking over a wet area. Almost seems like crossing over to another island. Uphill and downhill and then a bit of a difficult trail out to a point on the furthermost area. 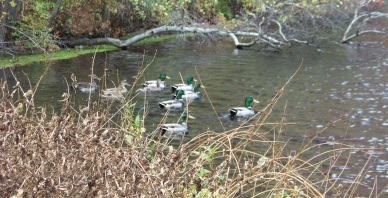 A marsh sits to the left and seems to be a waterfowl haven. 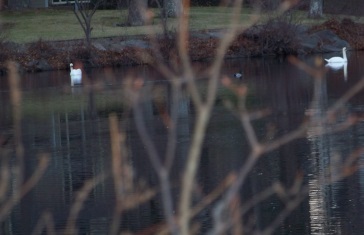 Actually the whole pond seems to be one. exit 15 off route 3 heading south on Derby Street. After passing the Derby Street shops, take a left on Cushing St. at the next set of lights. Cushing will intersect route 53, continue straight taking the turn to the right at the Ward St intersect. 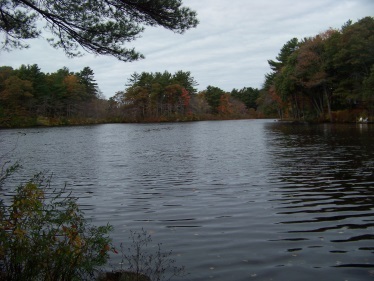 Follow past Eel River Conservation to shortly after the boat launch at Cushing Pond. To access the trail head, park and continue walking down Cushing St. to area between #39 and #27 Cushing St.